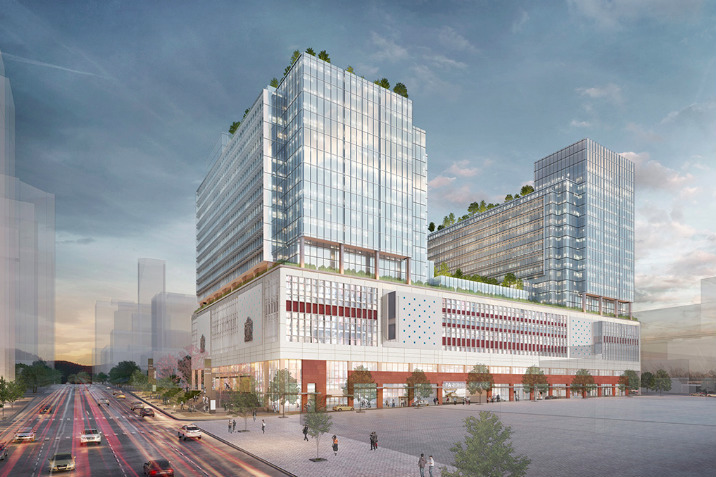 The online retail colossus Amazon will be moving into 416,000 sq. ft of office space that will be built in a new tower on top of the existing post office building. A second tower will also be built, adding 1.1 million sq. ft of office space to the existing structure, which occupies an entire block. Three thousand people are expected to work at the new Amazon offices, part of an overall workforce of 7,000 at the site. Prime Minister Justin Trudeau was on hand Monday for the Amazon announcement, which was held on the fourth floor of the post office. It looked a bit like a high school pep rally, with four banks of Amazon employees arranged around the podium. Speaking in front of an Amazon banner and flanked by piles of Amazon boxes, Trudeau quoted Amazon founder Jeff Bezos’s “every day is day one” philosophy. “I think Canadians also believe that every day is day one,” said Trudeau. “Generations of innovators, thinkers and hard workers have made Canada what it is today — a country where new ideas are welcome, talent thrives and creativity flourishes. “In 2011 we opened our first software development site in Vancouver, followed by an office in Toronto,” he said. Mayor Gregor Robertson noted “we are bumping up into 100,000 jobs now in Vancouver in innovation and tech,” and hoped for more connections between the tech world in Seattle and Vancouver. “I had the great pleasure of flying on the first flight, Nerd Bird, between Vancouver and Seattle last week,” said Robertson. The post office is owned by the British Columbia Investment Management Corporation (BCI), which purchased the site for $159 million in 2013. The project is managed by QuadReal Property Group on behalf of BCI, and will be known as The Post. QuadReal president Remco Daal declined to put a price tag on the development, which will be approximately 1.5 million sq. ft. But building costs are currently about $500 per sq. ft downtown, which means it could be a $650 million project. An earlier proposal that included residential towers has been shelved. Daal said each tower would be about 550,000 sq. ft. One tower will be located along Georgia, and will be 14 storeys atop the five-storey post office, or 19 storeys overall. The other tower will be along Dunsmuir, and will add an additional 16 storeys on top of the old building, making for 21 storeys overall. The announcement was totally scripted, but the press was allowed to ask a few questions at the end. Asked about government funding for a proposed new Vancouver Art Gallery, which some people argued should go into the post office, Trudeau talked about his government investing “record sums in arts and culture,” but didn’t address funding for a new gallery. Pressed further, he seemed a bit miffed.